Major General Robert Heine served most recently as the Director of Operations, Iraq Reconstruction Management Office, U. S. Embassy Baghdad. MG Heine was commissioned in the Chemical Corps after receiving a Chemical Engineering degree from Auburn University in December 1968. He remained at Auburn to complete his Master of Science in Chemical Engineering before completing his initial active duty for training. Major General Heine transferred to the Corps of Engineers in 1974. He served as a platoon leader, company executive officer, and company commander with the 478th Engineer Battalion (Combat)(Corps), commanded the 810th Supply Company, and then returned to the 478th for several staff assignments. His field grade assignments included Chemical Officer, 364th Engineer Group, Executive Officer of the 983rd Engineer Battalion (Combat)(Heavy), and S3 of the 364th Group. He commanded the 983rd Engineer Battalion from February 1990 through August 1993. Following command, he served as Real Property Maintenance Activity Manager for the 416th Engineer Command facility Engineering TDA, and Assistant Chief of Staff-Materiel at the 416th Engineer Command. He served as Chief of Staff, 416th Engineer Command from October 1996 through May 1999. He became the Deputy Commanding General for Mobilization and Training, U.S. Army Maneuver Support Center, Fort Leonard Wood, May 1999 and was promoted to Brigadier General on 1 December, 1999. He assumed command of the 416th Engineer Command and was promoted to Major General on 1 June 2002. Under his command, the 416th was mobilized for Operation Iraqi Freedom from January through July, 2003. In January 2005, he was again mobilized and transferred to Multi-National Force-Iraq, with service as the Director of Operations, Iraq Reconstruction Management Office, U.S. Embassy-Baghdad, where he served through June 2006. Major General Heine served on the Army Reserve Forces Policy Committee from May 2000 through October 2003 and on the Reserve Forces Policy Board from October 2003 through his retirement on 31 July 2006. 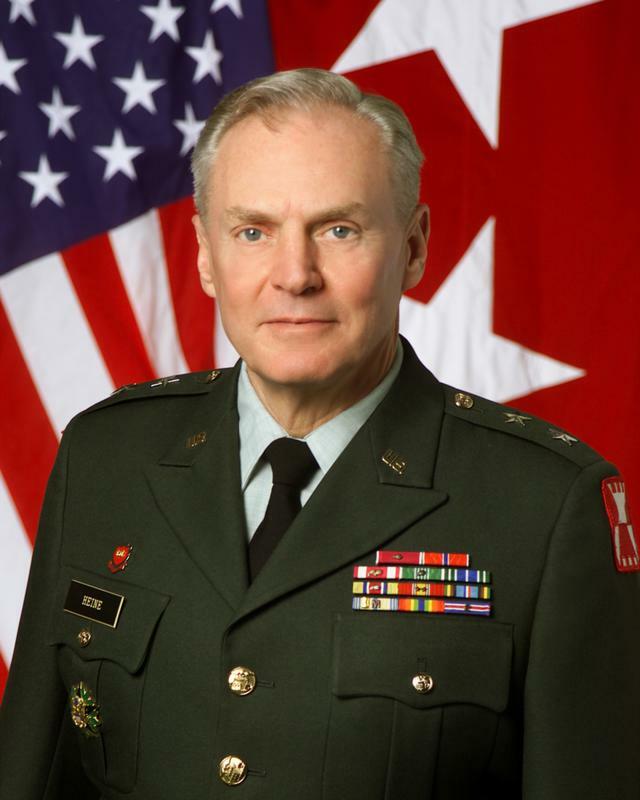 His awards and decorations include the Distinguished Service Medal, the Legion of Merit with two oak leaf clusters, the Bronze Star Medal with oak leaf cluster, the Meritorious service Medal with two oak leaf clusters, the Army Commendation Medal with oak leaf cluster, the Army Achievement Medal, the Office of the Secretary of Defense Identification Badge, the Army Staff Identification Badge, and the Engineer Regiment’s Silver and Bronze de Fleury Medals. For his service with the US Embassy Baghdad, he was awarded the Department of State’s Superior Honor Award. Major General Heine is a chemical and environmental engineer and is a registered Professional Engineer in Michigan.